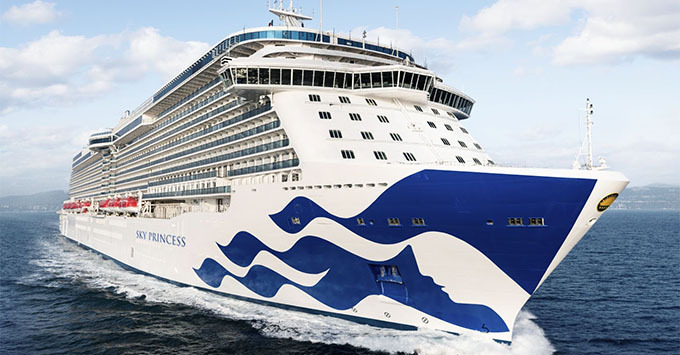 (10:15 a.m. EDT) -- Princess Cruises' newest ship, Sky Princess, will sail its maiden Caribbean season starting in December 2019. The Royal-class ship also will introduce a new suite category to the line. Sky Princess, which will homeport out of Port Everglades in Fort Lauderdale, will kick off the season with a three-night sailing, departing December 4, 2019. It will then alternate between seven-night Eastern and Western Caribbean itineraries from December 7, 2019 to April 4, 2020. A unique feature of the itineraries is that every port call to St. Thomas and Cozumel will include late-night stays. In addition, Princess revealed that Sky Princess will unveil a new suite category, Sky Suites. The suites -- located at the top of the ship -- will feature 270-degree views; occupants also will be able to enjoy the ship's outdoor theater concept, Movies Under the Stars, without leaving their rooms. The suites will hold up to five and offer the largest balconies in the Princess fleet. Princess plans to create a series of new amenities exclusive to the suites (more details will be released in the coming months). Joining Sky Princess in the Caribbean during the 2019/20 season will be four other Princess ships -- Caribbean Princess, Crown Princess, Pacific Princess, Regal Princess -- with all five offering a total of 10 itineraries. Like Sky Princess, Regal will offer weeklong Eastern and Western Caribbean cruises from Fort Lauderdale, with longer stays in St. Thomas and Cozumel. The longer Caribbean itineraries, which range between 10 and 14 nights, will be offered on Caribbean Princess and Crown Princess and focus on the Southern Caribbean. Sky Princess, Princess' fourth Royal-class ship, debuts in the Mediterranean in October 2019, where it will sail a variety of one-week Med cruises. Like its sisters Royal Princess, Regal Princess and Majestic Princess, the ship will feature the SeaWalk (a glass walkway that extends from the top deck) and Princess Live TV studio, as well as a handful of Princess staples like the multi-story Piazza atrium and adults-only Sanctuary sun deck.